If you budget with a spouse or partner it’s common to need to know who spent how much on what. With the Tiller Budget it’s super easy to set up a budget for your shared expenses and income. But how does Diane know whether she is spending more than Jack on groceries each month when they plan to split it down the middle? Our handy tags sheet can help you solve this riddle. It’s also great for any other detailed reporting you might need where using a single category doesn’t suffice. 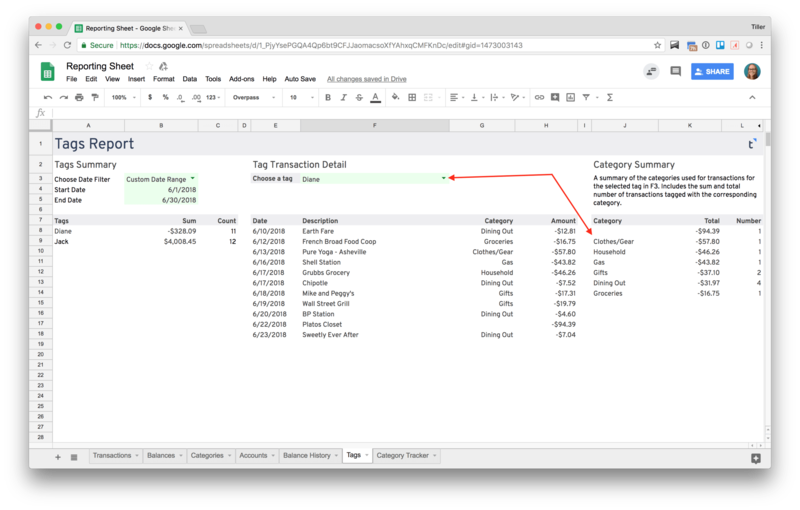 For example, if you’re a small business owner you could use this for tracking expenses related to a specific project or client and it’s really easy to see the tagged data across a custom date range. The first step for using Tags is adding the Tags column to your Transactions sheet. Follow these quick and easy steps to get started. Open the Tiller spreadsheet where you’d like to use tagging. Right click any column where you’d like to see and add tags. Choose “insert 1 right” or “insert 1 left” depending on your preference. Title the column “Tags” in row 1. If you’d like to use a consistent validated list of tags (similar to the drop down for categories) that’s pretty easy too. Reach out to support@tillerhq.com and we’ll explain. In our example here we’ve tagged transactions with Jack and Diane to be able to quickly see who is spending how much in certain categories. Next, you’ll need to add in our Tags sheet to start visualizing transactions organized by tags. Copy the URL of the Tiller spreadsheet where you want to use the Tags report. Open the Reports Master sheet here. Now you can update the date range to review the tags data for a selected time period or choose a tag from the list to start analyzing transaction details and review a category summary. The category summary is really useful when you need to check in on the total amount spent for certain budget categories within the month. If you split your budget categories down the middle with your partner you’ll know exactly how much you each have left to spend to help you plan for the rest of the month.